Ritual Wine Container (Hu), 1st century B.C. - 1st century A.D.
During the second and first centuries B.C., the wealth and cosmopolitanism of the Han dynasty produced a flowering of the arts: exquisite objects were made both for decoration and for religious or ritual use. Members of the imperial clan, as well as newly rich merchants, officials, and landowners, created a demand for elaborate burial paraphernalia that glorified filial piety. 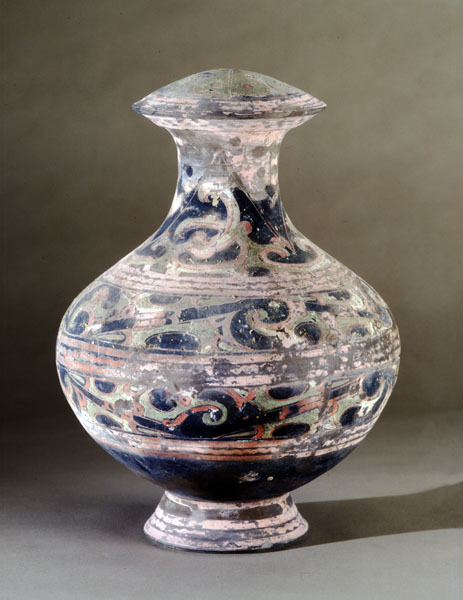 This pottery hu is an example of such funerary wares. Elegantly proportioned and painted in fluid, linear designs, the jar imitates in shape and decoration the more expensive lacquer and inlaid-bronze vessels of the late Warring States (475-221 B.C.) and Western Han (206 B.C. - A.D. 9) periods. Dynamic interlaced pointed and knobbed scrolls circle the body in two wide friezes. The domed lid is painted with abstract motifs that seem to derive from taotie (animal masks).